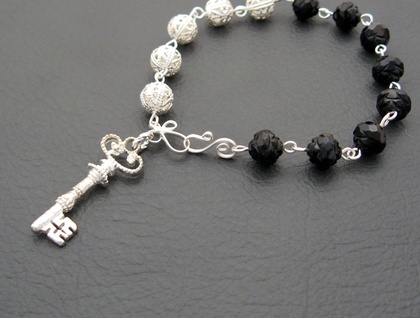 Silver filigree and jet black glass contrast in this Victorian-inspired bracelet. 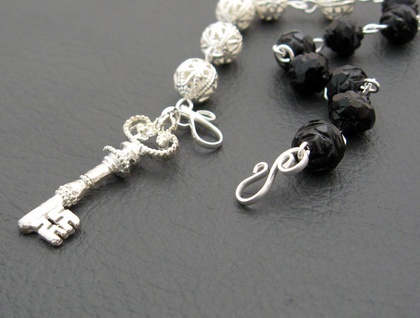 Five silver-plated filigree beads and eight shiny, black, glass rosebuds are linked together with silver-plated pins. The bracelet is finished with a scrolling, silver-plated hook and eye clasp. 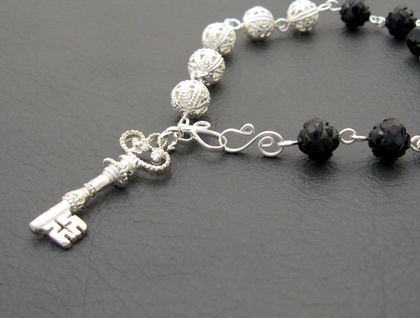 Near the clasp hangs a single, very ornate, silver-plated key charm. The rosebud beads have a hard, gleaming surface, like the jet (lignite) beads used in Victorian mourning jewellery. Jet is made from trees that have decomposed under pressure, forming a hard, shiny, black or dark brown substance. These beads are in fact made of firepolished Czech glass, which is famous worldwide for its high quality. Firepolishing is a technique whereby the beads are 'polished' by subjecting them to a very hot flame, creating a bright, shiny surface. Firepolished glass sparkles almost like crystal. 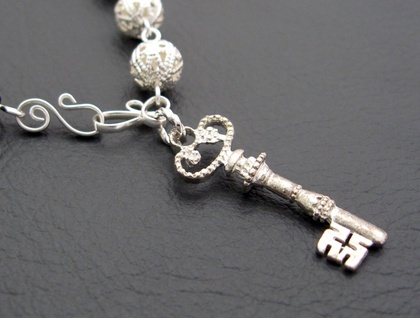 'Victorian Silver Key' measures 20.5cm, including both parts of the clasp, while the key is 31mm long. All findings are silver plated. If you would like it lengthened or shortened - at no extra charge - just ask in the 'notes to seller' field when you purchase the bracelet, stating the length you would like.